The problem with delaying this post by a month is that it doesn't take into account a lot of books I've now read. Case in point: I could have sworn I finished this goal, but when I looked back through my books from the first half of the year, not a single one had been hanging out on my to-read list since 2011. Then I remembered: I did complete it, but not until July, and I'm nothing if not stringent about deadlines. So you'll just have to wait until the end of the year report to find out what it is. Nope, not yet, but I still have big plans for this one. I really think it needs to be a Susanna Kearsley novel, so any recommendations for favorites of hers? Or I'm also still up for more favorite female authors to add to the list! I've wanted to read something by Wallace Stegner for years, and when my friend, Jen, volunteered to read Crossing to Safety with me, I jumped on it. Stegner's writing was poignant, tangible, and just so gorgeous, and it will easily be one of my favorite novels in 2016. Now I need to make a new goal: Read everything by Wallace Stegner. It is for this goal alone that I'm worried about my numbers goal for the second half of the year. I've decided to read Sense and Sensibility, but I am not a fast reader, particularly when it comes to the classics, and since I have to physically read this book in order for it to count, it's going to consume a big chunk of time that could be spent flying through other books. Do I care more about this goal or my numbers goal? Time alone will tell. This has seriously been such a fun goal to complete. I love sharing books with my kids. 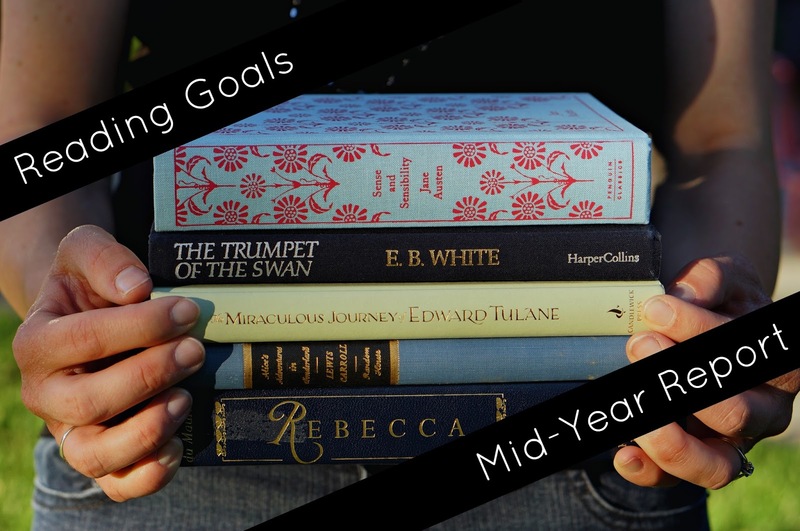 For the first time ever in my reading goals history, I changed a goal mid-year. Actually, it was much earlier than mid-year, but no one but me knew about it until now. Why did I do it, and, perhaps the more important question, why do I feel okay about it? Way back in January or February, I started making a list of possible Olympic books. Maybe I just wasn't looking in the right places, but I was having a difficult time finding any that actually piqued my interest (there was a Jesse Owens one and an Eric Liddell one, but without glowing reviews, I was pretty sure they weren't going to be the fast-paced narrative non-fiction that I love). But even without being too excited about it, it still would have been a goal I would have completed (I do love the Olympics, after all), but meanwhile, Mike and I were getting ready for our Europe trip, and I really wanted to do some reading for that to make it more meaningful. I could tell it was actually turning into its own goal and with them both happening around the same time (the trip in July, and the Olympics in August), I knew I was going to have to choose one or the other, and the trip won out. So there you have it. I've been reading The Monuments Men by Robert M. Edsel. I listened to about half of it before our trip, and I'm working on finishing it now that we're home. This goal has not been my top priority yet, but Alcott's better in the fall anyway, right? Still haven't decided which book of hers I want to read . . . This goal is supposed to be a mixed bag of past and potential winners. So far I haven't read anything current (although I have my eye on Wolf Hollow, The Wild Robot, and Pax), but I have read a few Newbery books from the past: Caddie Woodlawn (which won the medal in 1936), Rascal (which won an honor in 1964), and Heart of a Samurai (which won an honor in 2011). Even though I have some long books that still need to be finished for several of the above goals, this will be a fast and easy goal to complete, and I'm looking forward to it because I love poetry. I reread The Happiness Project at the beginning of the year (even though I've loved Gretchen Rubin's later books, too, there's just something about the innocence of her first happiness book before she became "the happiness expert"--I loved it). I've been saving Edenbrooke because I want to have something to look forward to in the fall. So how am I doing? Out of the twenty books I need to read in order to complete these goals, I've read nine-and-a-half. So that's basically like I'm right on track, although, like I said, I am a little nervous about some of the ones I've left for the second half of the year. Any suggestions for books I should read in order to complete the rest of my goals? I'm up for recommendations! I remember reading Stegner's Angle of Repose and really not getting into it. So I've avoided him since. But so many people have raved about him that I'm starting to think that I was just in a weird place and I should give him another try. I recommend Under the Lilacs for your next Alcott. It's got orphans and circuses and a lost dog and a little sister -- lots of fun stuff. Maybe I was just in the right mood for Stegner because I loved it. But it really doesn't have much plot and moves pretty slowly, so if that's not your thing, you're probably still not going to like it. Oh, Under the Lilacs sounds so fun! I'll definitely look into it!